I love experimenting with alternative grains and flours in my cooking. It is a great way to add an extra dimension to traditional recipes and get added fiber, nutrients and protein in dishes that are usually made with white flour. 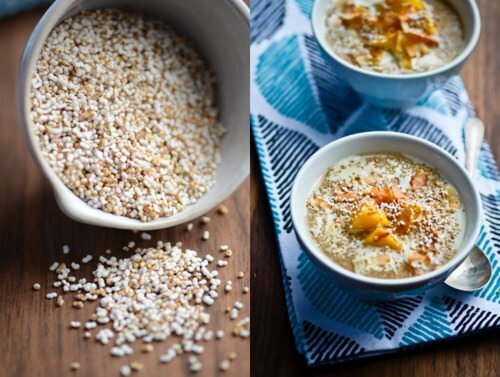 I saw this recipe on Naturally Ella a beautiful blog with amazing photography and recipes that you must check out and I decided it was time for me to give amaranth a try. Amaranth contains large amounts of protein, up to 30% more than wheat flour, rice and oats making it a good source of vegetarian protein. It is a gluten free seed that contains large amounts of lysine which aids in calcium absorption, and process protein. Amaranth can be ground into flour, flaked into oatmeal or popped like popcorn. 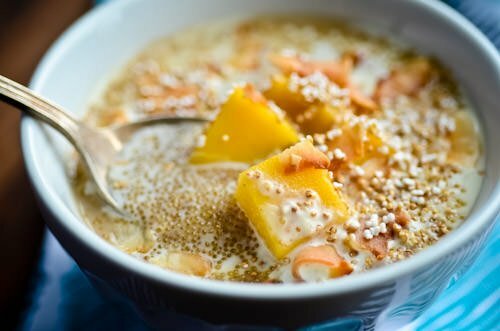 You can combine it with other grains like quinoa and millet for a unique pilaf or use it as a substitute for your favorite oatmeal recipe. Popping the amaranth is easy and fun, I felt like a little kid the first time you realize that popcorn can come from dried corn. You can easily skip the popped amaranth if you are pressed for time. It does add some nice texture and roasted flavor but the recipe will totally work without it. Take the plunge and try this healthy and delicious grain. It’s like having rice pudding for breakfast and who doesn’t love the idea of dessert for breakfast? 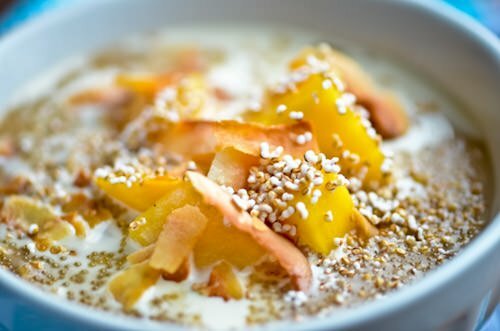 Rinse the amaranth well and add 1/2 cup to a small saucepan along with the coconut milk, cinnamon, cardamom, and maple syrup. Split the vanilla bean in half and scrape the seeds into the pot. Gently whack the ginger with the back of a knife and add it to the mixture along with the vanilla bean. 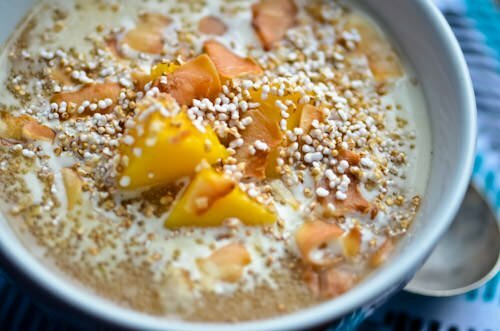 Bring to a boil, reduce to a simmer and cook, stirring occasionally for 15 minutes adding some additional coconut milk or water if the mixture becomes to dry. Turn the heat off, cover the pudding and let sit for 10 minutes to thicken slightly. Take the remaining 2 tablespoons amaranth and let dry thoroughly on a paper towel. Heat a small skillet over medium heat and then add the amaranth a tablespoon at a time, cover the skillet with a lid and let cook shaking the pan until the popping slows. Repeat the process with the remaining amaranth. 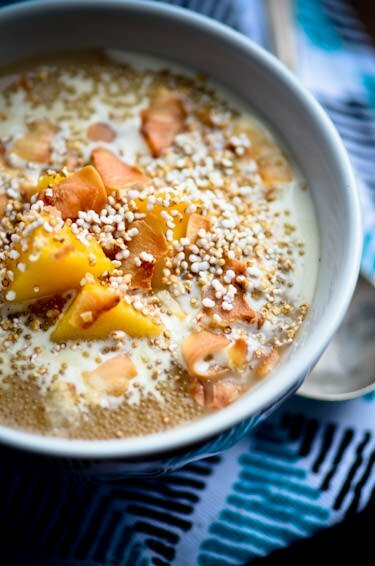 To serve portion the pudding into two bowls, top with the mango, coconut, popped amaranth and extra coconut milk.